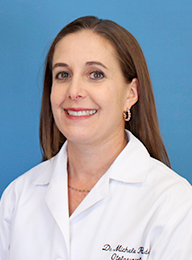 Dr. Richards joined Associated Coastal ENT in January of 2005. She resides in St. Lucie County with her husband, Ken and their three children. She comes to the area from Lexington, Kentucky where she spent several years practicing for a large multi-specialty group. Dr. Richards is originally from Michigan and graduated with high honors from the University of Michigan in Ann Arbor in 1993. She attended Washington University School of Medicine in St. Louis and received her Doctor of Medicine with honors in 1997. She was initiated into Alpha Omega Alpha, a selective medical school honor society, her senior year. Dr. Richards also received the American Medical Women’s Association prize, the Janet M Glasgow Memorial Achievement Citation, The Robert Carter Medical School Prize and the Merck Manual Award during medical school. After finishing medical school, Dr. Richards completed both a General Surgery Internship and Otolaryngology Residency at the University of Florida in Gainesville. She has published several articles related to measuring quality of life in patients with sinus disease and children with otitis media. Dr. Richards received the Joe Frank Smith Research Award in 1999, 2000, and 2001. She is Board Certified by the American Board of Otolaryngology-Head and Neck Surgery and is a member of the American Academy of Otolaryngology-Head and Neck Surgery. She has received numerous accolades from patient care websites such as vitals.com including the Patients’ Choice Award and the Compassionate Doctor Award. Her practice encompasses the range of Otolaryngology-Head and Neck surgery. Dr. Richards treats diseases of the head and neck including sinus and allergy, nasal obstruction, ear infections, hearing loss, thyroid disorders including thyroid and parathyroid tumors, hoarseness, head and neck tumors, face and neck skin cancers, dizziness, and throat problems. She is trained in the latest procedures including balloon sinuplasty. Her practice includes patients of all ages from infants to the elderly.